The City of Portland has been working with Portland State University students to determine whether the detection of bicycles at traffic signals can be best done with inductive loop detection or some other type. We have studied a variety of different detection types including video and microwave and thermal imaging and there are good applications for these different types depending on the infrastructure at your particular location. 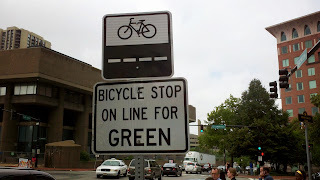 The standard detection remains inductive loops and with that sort of equipment, it is important to get people on bikes in the right spot so the traffic signal infrastructure can work as designed. 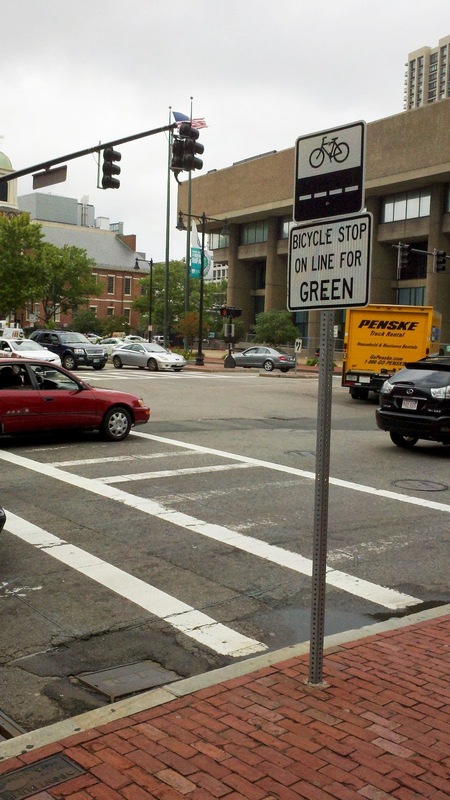 My experience in Boston, MA showed a new way of marking and signing where a person should locate themselves and their bike to get a green indication. I couldn't really determine what the sign meant. It's not intuitive to me and I wasn't sure where I was supposed to place my bicycle. I am hopeful someone will be able to tell me via the blog comments, without seeing the loop cuts in the pavement (see the last picture), I didn't know what the wording of the sign meant for me to do. I would compare this sign to the following video on being detected using the standard sign and detector marking. Would you know what sort of detector is used at the corner of North Interstate Ave/NE Lloyd Blvd/NE Oregon St? At this intersection, riders are able to move diagonally through the intersection from a shared path on the SW corner to the bike lane on the NE corner. 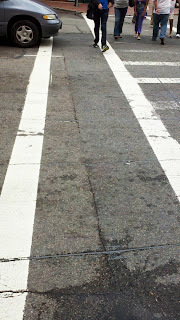 I couldn't see an inductive loop in the pavement, and I couldn't see any infra red or other sensing device. I loved the feedback light that displays at the top right of the lanterns when riders have been detected. I'd love to know what technology is being used here and how reliable it is. Yes, we have an inductive loop detector that is under the concrete there. The blue light is something that we have been experimenting with to see if they would provide people with good information about the fact that they have been detected.